Stephen Ambrosino is a well-rounded music professional. 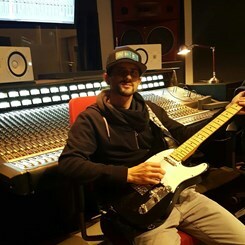 Working out of two Philly studios (Breed Studios, Philly JAM Recording), Stephen has garnered experience working with some of Philly's finest musicians, producers, and engineers. He currently gigs with two bands (Rogue Methods, Neisha Grace) and is writing his second release for his own studio project entitled "I of Amenti". Stephen's work can be heard on the radio, in commercials, and even in theater. He has been teaching consistently for twelve years. He also holds an Associates in Music from Montgomery County Community College, and has studied classical guitar privately with Allen Krantz (Temple Univ) for several years, and jazz guitar briefly with Ben O'Neill (U of Arts). Stephen's love of all styles of music combined with his passion for education, his tenacity to keep growing as a musician, and his energetic character, make him a great fit for young children and experienced adults alike.